MetaMLST is a computational tool for strain level identification from metagenomic data. It exploits the Multi Locus Sequence Typing approach and performs and in-silico reconstruction of the MLST-specific loci. 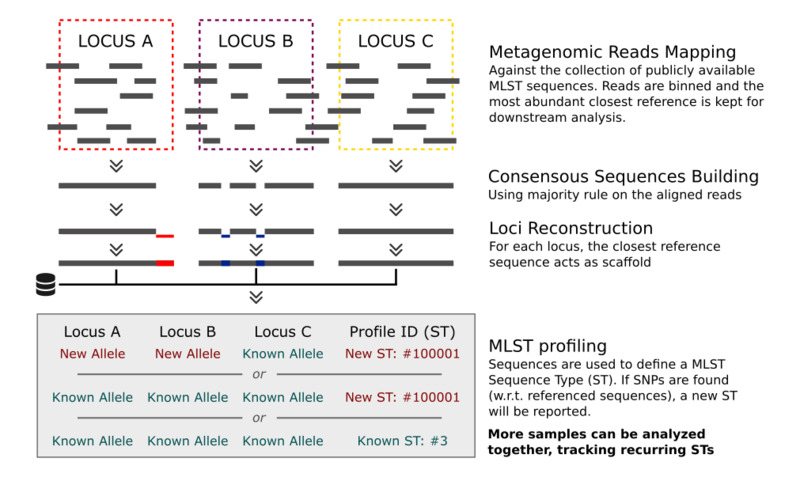 MetaMLST takes as input Shotgun Metagenomic NGS Reads in FASTQ format (e.g. Illumina Hi-Seq). MetaMLST only works with shotgun sequencing data, and it is not applicable to 16S rRNA sequencing datasets. a visual list of detected MLST-trackable microbial species. A tab-separated file containing the typings of each sample provided. One file for each species. A tab-separated file containing the updated typing table (i.e. known and newly identified Sequence Types). One file for each species. This step can be skipped if you use the pre-made database (metamlstDB_2018.db), which will be downloaded automatically if you do not specify any custom db. Step 0: Make sure you have all the requirements installed and available. Step 2: Create a Bowtie2 index from the default MetaMLST database. You can find example-scripts here: MetaMLST Examples. Unpack the archive and follow the instructions below to run MetaMLST on these test HMP samples. In each example, replace the .fastq file with your raw reads to run MetaMLST on your samples. Run the following test script: ./metamlst_examples/1_single_sample/test.sh. 3 ./out/merged/sepidermidis_ST.txt MetaMLST ST File Contains the new S. epidermidis ST table after the analys (all the known profiles plus the new profiles detected in the samples). Run the following test script: ./metamlst_examples/2_single_sample_custom_db/test.sh. #Create Database with the sequences from MLST_sepidermidis.fasta"
#Create Database with the typings from MLST_sepidermidis_types.txt"
Run the following test script: ./metamlst_examples/3_single_sample_multiple_species/test.sh. Run the following test script: ./metamlst_examples/4_two_samples_with_metadata/test.sh. MetaMLST output files can be used to generate Phylogenetic Trees based on the reconstructed MLST loci, as well as Minimum Spanning Trees (using tools like PHYLOViZ). In this example, 27 metagenomic files from the HMP (only P. acnes aligning reads are provided) are analyzed with MetaMLST. Using the --outseqformat A option in MetaMLST-merge, you can generate an additional file: ./out/merged/pacnes_sequences.fna, containing the aligned and concatenated sequences of each locus of the 27 samples analysed. By default (see metamlst-merge.py) there is one entry for each sample. MetaMLST allows to update the database with newly detected sequnces and typing. This can be useful in case of re-detection of a new ST while analysing a different sample, or to cross-compare different dataset analysed in different times. The updated ST table (./out/merged/sepidermidis_ST.txt), modified to include "#sepidermidis|Staphylococcus epidermidis" as first line. See the test script for furhter details. MetaMLST is a project of the Computational Metagenomics Lab at CIBIO, University of Trento, Italy.